Home Caledonian Ball 2017 Complimentary offer for Charity Ball ticket holders! 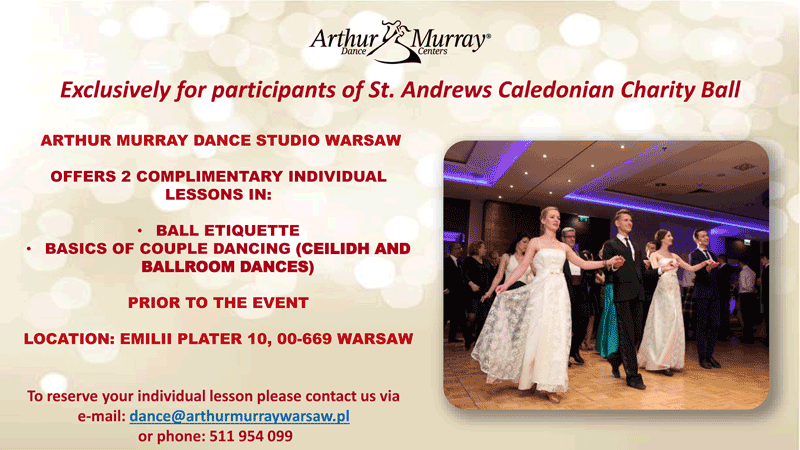 Our friends at Arthur Murray Dance Studio have put together a special complimentary dance tuition offer for 2017 St Andrew’s Caledonian Charity Ball ticket holders! If you’d like a complimentary dance lesson for two people you must take up this offer before the St Andrew’s Caledonian Charity Ball which is being held in the Warsaw Marriott Hotel on Saturday 25 November 2017. Take advantage of this super offer by contacting Arthur Murray Dance Studio by telephone, 511 954 099, or email dance@arthurmurraywarsaw.pl. You can learn more about Arthur Murray Dance Studios on their Facebook page, or on their new web site at http://arthurmurraywarsaw.pl/. If you still haven’t secured your ticket for the St Andrew’s Caledonian Charity Ball, you can book one of the few remaining tickets up until Sunday 12 November 2017 by reserving online here. Arthur Murray Dance Studios Warsaw, Caledonian Ball, ceilidh, Charity Ball, Reserve tickets, Scottish Country Dancing, St Andrew's Ball. Bookmark.